Belgian comic figures the Smurfs have been chosen as the fifth iconic image to adorn a Brussels Airlines aircraft. 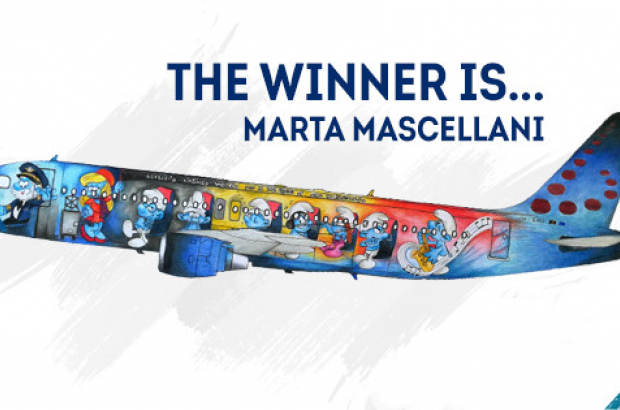 The national carrier had launched a public competition for the latest of its Belgian Icon series, which already consists of Rackham (Tintin), Magritte, Trident (Red Devils) and Amare (Tomorrowland). More than 1,400 proposals landed at Brussels Airlines and a special jury of famous Belgians selected two finalists from a shortlist of ten. A public vote gave victory to the Smurfs over the theme of Horta’s Art Nouveau. The winning design was by Italian student Marta Mascellani. In fact, the little woodland blue creatures with a white hat, were the frontrunners since the start of the competition. The final version of the special livery Airbus A320 will be unveiled in March, in time for the Smurfs 60th anniversary. Originally known as the Schtroumpfs in French (Dutch The Smurfen), the characters were created in 1958 by the Belgian comic strip artist Peyo. In 2018, his colony of more than 100 figures will be celebrated in exhibitions and events across the country.